What's the most important step in anyone's beauty routine? It should be sun protection. Whether you're driving to work or walking, sitting on the beach or using fake tanner on those gams, you need to protect your skin. This cannot be said enough! As a fair-skinned gal -- I could be confused with Casper the Friendly Ghost most of the time -- I definitely need to slather myself with sunscreen or I'll look like a not-so-friendly lobster. My sunscreen of choice? 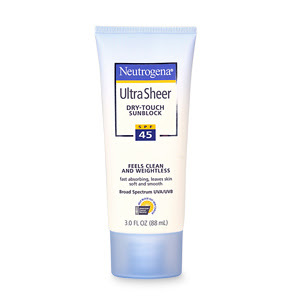 Neutrogena Ultra Sheer Dry-Touch Sunblock. This has been my skin's saving grace for the last three years, and let me just tell you that I've successfully refrained from burning each year! I was especially successful this past weekend, as I sunned myself on the beach in New Hampshire for three days straight. I love this sunblock for many reasons. First of all, it's sweat-and-water-resistant, which is perfect since I actually like to jump around in the waves when I'm on the beach! It also sinks right into the skin and doesn't feel greasy, slick or slippery upon contact, so I don't slide around on my towel or beach chair. It's even enriched with Vitamins A, C and E to moisturize skin and prevent environmental damage. But the greatest thing about this sunblock is that it's available in a ton of different SPFs. I went with 45, which was definitely enough to keep me from burning and even let me get a teensy bit of bronze tint to my skin (though unless you know me, you probably wouldn't be able to tell!). But if you're seriously afraid of the sun -- or you burn even worse than I do -- it goes all the way up to 70! They're available for $8-$10 on Drugstore.com. So cheap when it comes to protecting that gorgeous skin of yours, right? I love this stuff and wear it almost daily; it's great. :) Probably one of the strongest sunblocks you can get for such a small price! I usually opt for the 70 whenever I'm going to be outside more than a half hour, simply because I'm so pale and can burn to a crisp in 15 minutes in the desert sun... LOL. I wore the 70 one summer. Some days it didn't bother me, but other days it felt like a second skin. You've got to be careful not to touch your face or it kind of rubs off... I moved away from sunny CA, so no more SPF 70 for me on the east coast!